At an elevation of 6,683’, Mount Mitchell is the highest peak in the eastern United States. It’s a beautiful one hour drive from downtown Asheville on the Blue Ridge Parkway, and then a short uphill walk to the observation deck with sweeping 360 degree views of the surrounding mountains. Before reaching Mt. Mitchell, this adventure will include another premier destination for visitors to western North Carolina, Craggy Gardens. We can choose one of the two great little 20 minute trails through rhododendron thickets to beautiful views from either vantage point. The photo above shows the Craggy summit taken from the alternative trail which passes an old shelter and opens into rhododendron covered meadows looking out across the Applalachians. 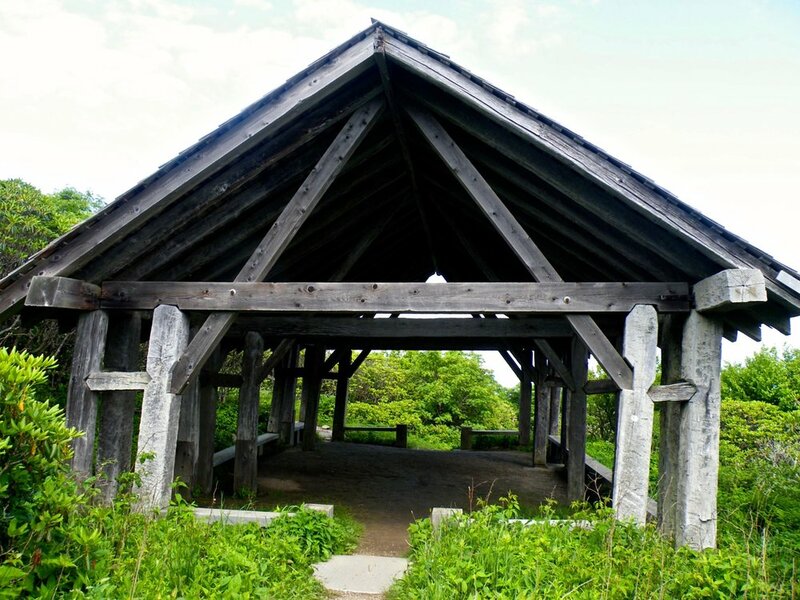 There are picnic grounds both at Craggy Gardens and at Mt Mitchell. Depending on the time of our departure, you can enjoy either a gourmet picnic or an evening hot dog (organic) cookout, complete with entertainment ~ original songs, banjo tunes and stories, whatever you like.